Early Spring Butterflies. Where Do They Come From? Spring has arrived and here in the mid-south the gardens are waking up. One sure sign that winter is over are the early spring butterflies. When the sun shines and the temperatures rise a bit, it is always exciting to see the first butterfly of the season. It often appears when you least expect it and the question of where it came from and how it survived the winter is something we all wonder. Did it hibernate in some cozy crack in a tree or did it emerge from a chrysalis where it remained dormant all winter? The answer actually depends on the specific butterfly. 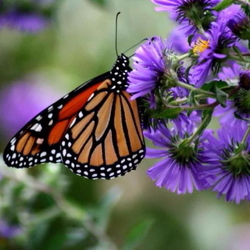 There are several ways that butterflies live through harsh conditions and how they find food in those early spring days when few flowers are blooming. 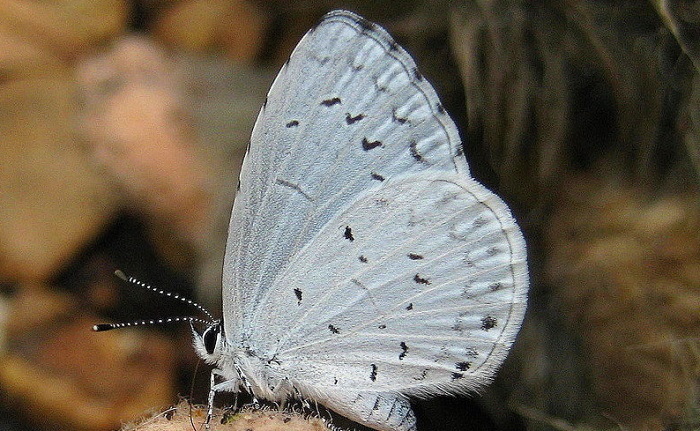 In western Kentucky and most of North America the first butterflies of the year are often spring azures (Calastrina ladon seen below) or cabbage whites (Pieris rapae seen above.) Both butterflies overwinter as chrysilids that pass the winter in leaf litter and scrubby underbrush. They emerge from this phase in early spring, which can be any time from January to May, depending on the latitude. 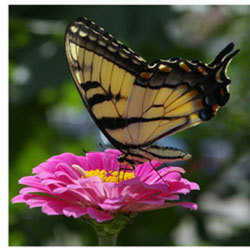 Since these butterflies have a vast range covering most of North America, many gardeners are quite familiar with them. As expected, they like nectar from our earliest flowers, including dandelions, violas, various mustards and plants we'd class as weeds. As soon as they emerge, they go about the business of reproduction. The spring azures prefer a number of woody shrubs as hosts, especially dogwoods, but are never present in enough numbers to cause any real harm. The cabbage whites favor plants of the Brassica family and the caterpillars often cause problems for gardeners who plant early spring cabbages, radishes and collards. Since there are so many wild plants in the Brassica family, there's absolutely no way the gardener can eliminate all of those hungry little mouths munching through their gardens, so their survival is safe despite all efforts to eradicate them. Some brave butterflies actually overwinter as adults. They find a safe, dry spot and actually hibernate through the worst of the winter, emerging in the very early days of spring as worn and ragged individuals that only live a few days before they deposit their eggs on a host plant and die. The most familiar butterflies that do this are mourning cloaks (Nymphalis antiopa, seen below) and commas (Polygonia comma seen in the header image.) Both of these butterflies often feed on tree sap that forms at the edges of new leaves or rotten fruit found under trees and gardeners observing the feeding butterflies closely, swear that the fermenting fruit sometimes results in drunken butterflies that fly in a wobbling, haphazard pattern. Commas use trees and shrubs as hosts, most often elms and hackberry species. Mourning cloaks have similar host preferences including elms and willows. Other butterflies like various checkerspots and skippers spend the winter as caterpillars. The caterpillars often roll themselves in leaves and spend the winter tucked in brush piles and scrubby areas. Some butterflies simply lay eggs on leaves and twigs that fall to the ground after frost and the eggs wait out the winter to hatch as little caterpillars. The big question is, how do butterflies, caterpillars and chrysalids keep from freezing to death? These insects do not live in balmy winter areas. They are found where some of the harshest winter conditions are commonplace. How can these frail little creatures survive outdoors, when humans are hard pressed if outside in the elements? Actually, it isn't a mystery at all. 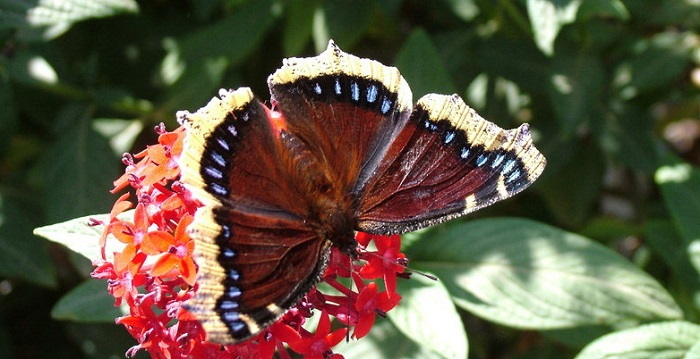 Butterflies, like most insects have a built-in survival system that defies the elements. As summer fades into fall the butterfly or caterpillar simply quits eating and purges its body of any food or substances that might freeze and cause damage. The insect then produces a type of antifreeze called Glycerol and enters a state of suspended animation called diapause. It is similar to hibernation in higher animals, however for all intents and purposes, the insect appears dead. Gardeners have even reported seeing butterflies covered in snow. 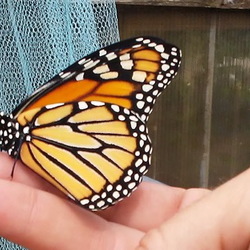 Being cold blooded creatures, their movements are largely connected to the outside temperatures, however butterflies have a special metabolism that allows them to store body heat. They fly best when the air is at least 80 degrees Fahrenheit, but a butterfly can store heat in its body so that if the air temperature is 60 degrees, it can maintain the 80 degree internal temperature. This is one way that they can fly so early in the season. Generally each insect has an internal clock that allows it to wake up in a specific time period after entering the diapause state, another factor is the air temperatures. Others wake according to daylight length or a certain number of days above freezing. All in all, it is a beautiful system. What gardeners need to know is the leaf litter and scrubby dead plant stalks are essential for their survival. They snuggle down in these little piles and await the changing of the seasons. Fastidious gardeners who carefully remove every dead leaf and twig from their prized beds are most likely throwing away butterflies in one form or another. Resist the urge to sweep everything bare each fall. Your perennials will benefit from a little extra insulation anyway. In the spring, simply rake and remove what you must, but remember that there's more than just dead leaves and dried stems in your garden. More often than not, a number of this year's butterflies are also there in one form or another.